Novation has announced Circuit, an all-in-one standalone box for electronic music creation. Korg recently release firmware v1.10 for the 2014 edition of the Electribe, which adds many new features. Elektron announced that the Overbridge plug-in is now available in v1.0 for Ableton Live and launched a special sale on their Analog Machines. Elektron released v0.9.5 public beta for the Overbridge software, which is available for the Analog Four, Analog Keys and Analog Rytm instruments. Elektron has launched the public beta version of their Overbridge utility plug-in, which has been expected since Musikmesse 2014. Elektron offers a 15% discount off its hardware until December 14th. 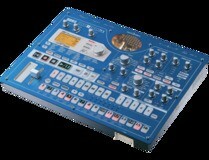 Korg introduces today its new products for the fall term, and among them two new versions of the legendary Electribe. Elektron has just released version 1.01 of the OS of its Analog Rytm drum machine. Elektron announced today that they started shipping their new Analog Rytm drum machine. Elektron doesn’t have any new hardware to show at Musikmesse 2014, but an innovative hardware/DAW integration technology.